Congratulations to the winners of the 2019 Magna Awards. This is the second year that the Magna Awards have focused on equity. The winning programs – three grand prize winners and 15 first place winners – cover the gamut of innovative ways to remove barriers to underserved students. In “The Hard Work of Equity​,” you’ll find information on excellent district programs with a proven track record of success. Every school stakeholder hopes that students arrive school with a hunger to learn each day. However, far too many students miss a morning meal, resulting in hunger for food, not knowledge. Is TV watching contributing to the achievement gap? Visit our highly organized in-depth archives curated just for you. Never miss an issue of the premier publication for school leaders—subscribe today. 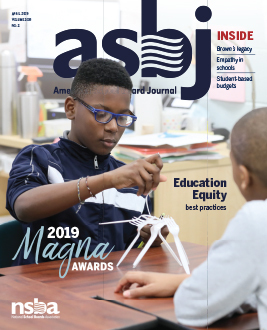 Advertise in ASBJ and with the National School Boards Association. Learn more.